Students have many things going on for them on a daily basis. A day in the life of a college student, be it a senior or sophomore comprises attending classes, extracurricular activities, and meeting assignment deadlines. 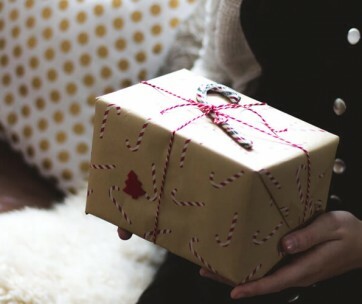 These activities all take place without forgetting to squeeze in time for friends and family. With your life being so full constantly, you need to find balance concerning time management, to ensure that no activity eats into the time of the rest. However, this can’t be achieved without the help of a student planner. Planners help you keep tabs on yourself, concerning where you need to be and the things you need to do. To help you organise your schedule like a pro, we’ve come up with a list of the best student planners. 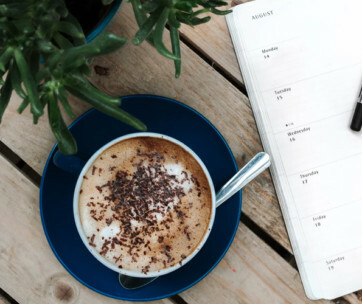 While some are used strictly as planners, others offer additional features that help keep you on track and meet all goals set for a day, month or the first six months within a year! Panda has created a movement that encourages all of us to live life to the fullest, and not to exist merely. 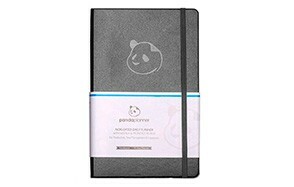 To ensure that we’re not robbed of our destined lives by the stress and demands of the modern world, the Panda Planner was designed. This student planner helps you stay on top of all your tasks by unlocking your focus and organisation skills each time. You might not feel this way right now, but with the Panda Planner, you will realise just how badass you are. This planner features undated pages meant to last for the quarter of a year. It is bound in a hardcover which protects the internal pages and can be used as a gratitude journal, daily planner and a calendar. Each purchase comes with the bonus gift of eBooks with topics like “A Billionaires Guide to Productivity & How to Crush Your Goals. There is also a video mini-course that teaches you how your productivity can be skyrocketed. Be sure to also check out our list of the best diary planners for more great items like this. Gain total control of your entire year with the 2019 planner. This is one of the best planners for college students, as it features twelve months of weekly and monthly pages for easy scheduling during the year. 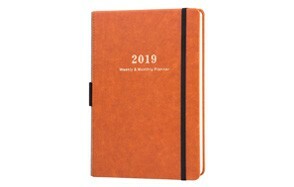 Generally, the 2019 planner is one elegant and simple book that has been designed with a soft-to-touch and environmentally friendly faux leather cover. Keep track of all your plans with the monthly view, as each monthly spread features a notes section and an overview of the month. This makes keeping special dates and events at the top of your mind throughout the year. To break down your month into weeks and days for a step-by-step executing, the 2019 planner features a weekly spread where you can keep clear track on all your daily schedules and appointments. Other features possessed by this annual planner are its unique A5 pages, ribbon bookmarks, internal pocket pouch and reference information. You’re at liberty to return this planner for a full refund from our fantastic customer service team if you don’t like it. Become the best version of yourself with a better organisation of your life. This seems harsh initially, but the Passion Planner by Daily Agenda makes this an easy feat. Make your dream life a reality by placing them in your Passion planner, a school planner that supports you as you break down both your long and short-term goals into tasks that can be incorporated with ease into your daily life; you can call this planner your personal life coach that fits easily into your handbag. Although it may appear as such, the Passion planner is no ordinary planner; it is designed to help you reflect on your past, look forward with eagerness into the future and most importantly, undertake actions needed in the present. This planner features a blank space for all your doodles, especially during a boring class, or extra notes and task check-ins. It is a hand-bound planner endorned with a soft faux-leather cover and a ribbon marker. With every purchase, you gain access to free PDF’s found on the Passion Planner official website. Be sure to combine this with a cool mechanical pencil from our list. The Mountain Daily Planner is known by many as the best daily and weekly planner who is also used as a gratitude journal and monthly calendar. Made with luxurious leather, this hardcover notebook features three satin bookmarks meant for daily, weekly and monthly usage, enclosed within a robust elastic closure. It’s made up of 6 months’ supply of 100GSM A5 paper and has a bonus of lined pages at its back. You can keep a different pen in its pen holder and keep your cards handy in its inner back pocket for emergencies. The layout of this planner features updated pages and spaces with size monthly calendar spreads. Take charge of your life once more by planning all your tasks, highlighting your priorities and checking in with a progress report every time you nail a goal. This is one of the best planners for college and is a must have for both students and anyone who seeks to improve their productivity levels. Gratitude Journal + Monthly Calendar. Another leather planner that makes an appearance in our list is the Simple Elephant Planner. This planner has been featured on several media platforms such as FOX, NBC and ABC, and is backed by hundreds of positive face-star reviews. It is a daily organiser that enables you to draft all your affirmations, gratitude and goals which will motivate you on a regular basis and ultimately lead to a happy and more fulfilled life. The Simple Elephant planner utilises a system that holds you accountable for the reaching of your goals which also helps you overcome procrastination. It enables you to keep high priority tasks at the top of your mind and helps in keeping you organised even on excessively hectic days. This planner features a leatherette hardcover, thick premium paper, 59 note pages, a reinforced pen holder, three bookmarks and bonuses of extra sheets of stickers and a gift box! There’s a refund available for users who don’t fall in love with this personal organiser at any point in time, with no questions asked. Our handy guide to the best fountain pens features more great products like this. With over a million people attesting to how the Full Focus Planner has improved their lives, its inclusion in our list was a must. 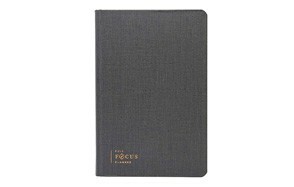 Designed by Michael Hyatt, the Full Focus Planner focus on the use of human psychology to engage your mind and help you reach all your goals that once seemed almost impossible. You are given a new perspective on priorities and single focus on tasks that matter the most. This can be used as an academic planner by college students as it helps you separate your daily tasks from your highest-leverage activities, making you more productive every day of the year. Michael Hyatt is one of the world’s best productivity experts who utilises several popular principles found in his pieces of training and courses, to help people reach their full potential. This makes for an excellent assignment planner, as you get to list all daily tasks, stating those with high priority and those that can be done right after. It is a must-have for every college student who loves organisation. Be sure to also check out our list of the best sketchbooks for more great items like this. Jot down all your ideas, track your workouts, create a meal plan, monitor your budget and write down your grocery list in the Planner 2019, a great college planner for post grads and undergrads. This is an annual planner meant to help keep track of all your agenda and can double as a calendar and gratitude journal. You can also use this to keep track of your class schedule, date nights and other activities you want to partake in. Featuring twelve months of weekly and monthly pages, the Planner 2019 features a thick off-white paper which has been designed to resist all the stress imposed by a passionate artist or write through constant erasing, shading and even ink bleeding. All materials used for the planner 2019 are environmentally-friendly, acid-free and pose no risk of pollution. Other features that make this a fantastic assignment planner are its pen loop, bookmark, inner pocket and elastic closure, not forgetting the bonus gift box included in each purchase. Love this product? Check out our review of the best bolt action pens you can use with this planner. Get the right things done first, and say goodbye to your days or constant procrastination. Enjoy a fulfilling life with the Next Level Daily Planner, a reliable writing tool that helps keep you accountable and also enhances your productivity levels. By moving your thoughts onto paper, you declutter your mind and ultimately get more organised both on the inside and outside. This student agenda book is an aesthetically pleasing entity that features a durable PU leather cover, high-quality paper, undated pages meant to last for six months and premade habit trackers compiled into one with elastic strap closure. The professional outlook and elegant design of the Next Level Daily Planner make it fit comfortably in many locations, from a college classroom to the comfort of a boardroom or even on your favourite coffee shop corner table top. It’s easy to slip into your handbag, briefcase or backpack as its extremely lightweight. You won’t feel a thing! Get the Phoenix Journal and watch your life transform in twelve weeks! Yes, only 12! Developed by professionals using simple, proven strategies, this planner seeks to dramatically increase your level of effectiveness in life, as well as your engagement levels. It encourages you to set a long-term, 12-week vision, which is then broken into daily and weekly goals. Each task undertaken and completed gives you the best feeling in the world, something that only a handful of people experience. This then becomes your motivation as you strive to achieve the entire twelve weeks. Change is constant in life, which is why our plans and goals may need a little tweaking now and then. Adjustment is made easy by the developers of the Phoenix Journal by providing users with a chance to augment plans on a daily basis to prevent you from not attaining your long-term goal. No doubt one of the best academic planners, this pocket planner features heavy white pages, a black faux leather cover and no risk of bleeding when a pen is used. Find more great products like this by checking out our guide to the best writing pens for work. The beautifully crafted Smart Planner Pro is a twelve-month planner that features a 12-month layout made up of 52 weeks. This weekly planner uses a scientific approach to productivity to ensure your success in reaching your highest potential. It is the ultimate tool for turning all your dreams and wishes into reality. Say goodbye to procrastination with this a5 notebook made up of 120gsm bleed proof paper, an elastic strap closure, a smooth and sleek animal-friendly leatherette cover and an added inner back pocket. It keeps you on track every day, week and month in the year and increases your passion for a balanced life which included gratitude affirmations, undertaking tasks and habit tracking. Make that commitment to the universe by penning down all your goals in the Smart Planner Pro, and if you don’t fall in love with it the way we have, you can send it back for a full refund. Layout - Depending on what how you plan to use your planner, keep an eye out for those that offer you the liberty to do more than writing. Some planners listed above come with extra spaces for impromptu notes and doodles, and these spaces are vital as they help you include tasks to your daily ones, or help you upgrade existing to-do tasks. Size - Keep an eye out for student planners that are easy to carry around. We usually advise that students get planners with A5 sized pages as these are more convenient to carry around with all your other essentials. Style - Concerning the design of a planner, selection may be subjective. But mainly, everyone loves creative and exciting aesthetics. Having a stylish and visually appealing planner plays a vital role in motivating you to use it this, look out for one that resonates with your style. It could feature lively colours, or have lined pages. Whatever your style is, ensure that your planner is a perfect match. Goals & Project Pages - Several planners on the market in recent time feature specific pages or sections for the listing of goals and projects. This helps keep the user on track and also makes finding your goals easy when it’s time to cross them out. Ensure that any planner you are about to purchase comes with places where you can write down your goals and tasks. Added Tools - Everyone loves exciting additional features found in any product they are buying. Some of the best-added tools many planners possess are bookmarks, stickers, pen holders and inner back pockets. These tools help in keeping your organised and make identification of daily, weekly, or monthly tasks easy. Q: Who Needs a Student Planner? A: Every student is looking to stay organised in all aspects of their lives, both academic and non-academic, and those who want to move from being chronic procrastinators to getting things done quickly and on time. Planners are also recommended for students who wish to properly schedule and allot time to several tasks to ensure no aspect of their life suffers. Q: What are the benefits of using a Planner? A: Mentally calculating all the things, you have to achieve in a year can be completely overwhelming. They seem too much for you to handle when you view them this way, which is why planners exist. Planners help keep your thoughts and dreams organised, whether they’re for the long-term or a short-term vision. The planner also prevent you from procrastinating by helping you break down your tasks into simple, manageable activities that are easy to undertake. Q: Why should I choose a paper planner over the planner app? A: There is a certain magic in writing your goals down by hand. 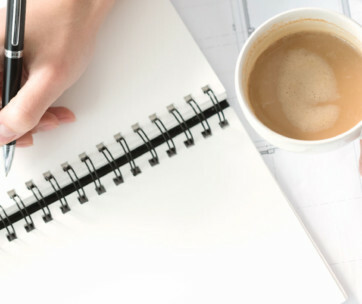 Penning down your dreams and aspirations serves as a motivator to get them done faster. A planner is similar to a vision board; thus, it requires a total investment on your part, one of which is to pen your dreams and goals down on paper. Q: How can I plan more effectively? A: Before getting yourself a planner, identify what you want to use it for. Are you hoping to organise your assignments? Or you want to manage your time correctly by outlining all your extracurricular activities. List your ultimate goals, before breaking those down into daily tasks and activities for easy completion. You might not realise it initially, but in time you’ll see yourself halfway towards your goal.